1.Grease a 13” X 9” baking dish with olive oil or butter. 2.In a medium bowl, mix all the chesses, sour cream, salt, pepper, Italian seasoning, sugar, and lemon juice. Mix all ingredients well and set aside. 3.Crash the crackers and divide them equally into 4 small bowls. Place one bowl of the crackers in the greased baking dish and spread the crackers evenly. Pour the first can of the tomato (no need to drain) and then spread the second bowl of crackers evenly. Pour the second can of the tomato and place the third bowl of crackers and spread them evenly. 4.Pour the cheese mixture on top of the tomato and sprinkle the last bowl of the crackers. Sprinkle some paprika and parsley leaves. 5.Bake at 350F oven for 35 minutes. 6. 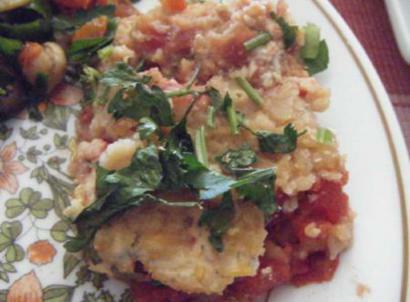 *My American mother, Diana, just prepared this wonderful and easy dish on Christmas day! The original recipe calls for mayo instead of sour cream. If you can find vegan mayonnaise, use it instead of sour cream (no need for salt/sugar/pepper/lemon juice).